The tornado damaged a mobile home, toppled trees, and several buildings. (CNN) -- A broad band of severe thunderstorms Sunday sparked heavy rain and hail and prompted tornado warnings from Florida to Virginia, with multiple twisters reported in North Carolina, according to the National Weather Service. At least eight unconfirmed tornadoes were spotted along North Carolina's I-85 corridor between Charlotte and Greensboro, with overturned mobile homes, toppled trees and downed power lines left by the storms, the weather service said. "It's been a very active evening for most of central North Carolina," said Julia Jarema, spokeswoman for North Carolina Emergency Management. The storms caused scattered power outages throughout the state, but because of the multiple bands of storms "things are changing so rapidly we haven't been able to confirm numbers," Jarema said. Video showed a portion of metal roofing was ripped off an industrial building in Belmont, North Carolina, west of Charlotte, littering nearby trees with clumps of yellow insulation. Multiple mobile homes were overturned in Linwood, North Carolina, outside of Lexington, and at least three people were reported injured, said CNN meteorologist Jacqui Jeras. A video posted on YouTube purportedly showed flashes of snapping power lines as a huge funnel cloud loomed over High Point, North Carolina, near Greensboro. 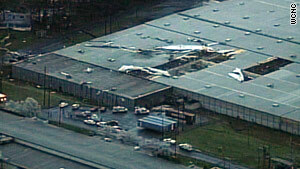 At least 20 homes were reported damaged in the area, the weather service said. High Point emergency management officials were going house to house checking for possible injuries, according to a fire department spokeswoman. Local law enforcement reported another tornado north of Greensboro, North Carolina, the weather service said. The storm was also producing 70 mph winds and hail as large as baseball or tennis-ball size, Jeras reported. "As daylight comes we'll know really more about what kind of damage we are facing," Jarema said.